What is the reason and outcome of coronary artery bypass graft abroad? What you should know about the procedure with Medical Holidays Abroad? 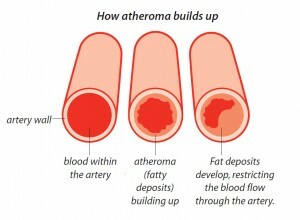 An atheroma is a gathering of macrophage cells and debris in the artery walls. It is commonly described as an abnormal fatty accumulation in an artery. It forms in the condition known as atherosclerosis. Although the condition is highly unhealthy, it is quite common nowadays and more and more people suffer from it. Who are most prone to develop atheroma? Majority of patients with developed atheroma are men and the risk of the disease increases with age. There are various reasons why the disease develops, the most common ones include bad diet (too much animal fat and sugar) and stress. What are the risks connected with untreated atheroma? In the developed atheroma, cholesterol gathers in the artery. Clots appear which in the following stages clog the arteries which leads to ischaemia of organs. Lack of treatment of this disease may lead to hear attacks, apoplectic stroke and angina. The symptoms of the disease are very hard to be diagnosed, especially in early stages. It is better to prevent the disease than look for any early symptoms which in most case never appear until the disease is quite advanced and causes for instance a heart attack. In the advanced stages one may feel pain in the chest which spreads toward arms, neck and lower jaw. Frequently patients feel pain in their legs while walking, numbing hands problems with sight and speech. In treatment of atheroma includes mostly the decrease of the blood pressure and the amount of cholesterol in blood. Advanced disease requires a surgery in which the surgeon removes the excess of cholesterol and the clots. Another method is the performance of by-pass. How is the surical removal of atheroma performed? One of the most common surgical procedures involves making a small incision along the atheroma and releasing the capsule. Then the surgeon puts the stitches. The procedure is performed under local anesthesia. The prices stated are estimates taken based on todays exchange rates of GBP and EUR. Upon dental consultation an exact quote will be given taking into consideration all details of the patients treatment. The destination where you choose to receive your treatment may affect the overall cost of your treatment. Go to Destinations to check prices from particular city. After the procedure the dressing needs to be changed. The stitches are removed after 5-12 days.